vivo is all set to unveil the vivo X27 on March 19, and thanks to TENAA, we already know what this smartphone will come packed with. However, just ahead of the launch, the company has shared two posters confirming key specifications of the X27. 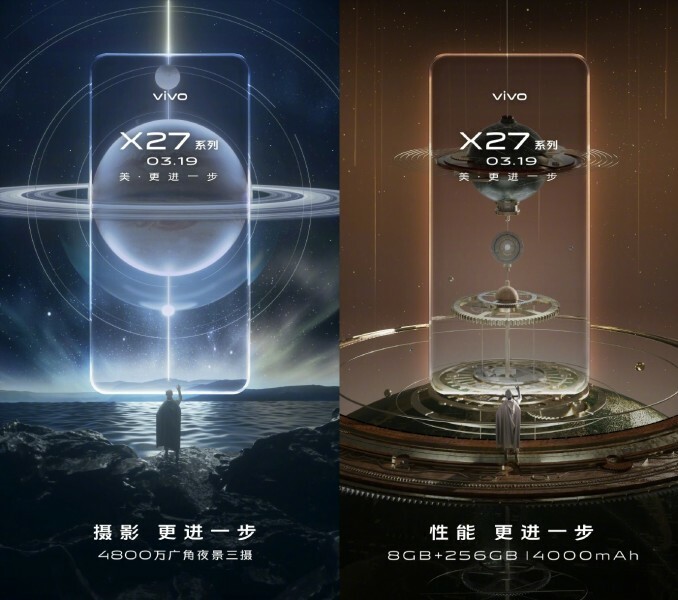 These posters confirm that the X27 will come with a 48 MP rear camera, 8 GB RAM, 256 GB storage, and a 4,000 mAh battery. One of the posters also hints at the smartphone coming with a Night Mode for better low light photography. Previously leaked images have shown us that the X27 looks similar to the V15 Pro. It also appeared on TENAA with a 6.39-inch AMOLED display and a triple camera setup on the back consisting of 48 MP, 13 MP, and 5 MP modules. The selfie camera popping up from the top will have a 16 MP sensor. The X27 will come in two variants - one powered by Snapdragon 710 with the other running Snapdragon 675. The former will feature an in-display fingerprint scanner whereas the latter will sport a conventional one on its back.